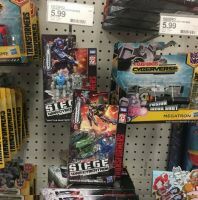 Good hunting to all this weekend, as TFW2005 member primeisboss reports finding Battle Masters Pteraxadon and Aimless at a Franklin, TN Target location. 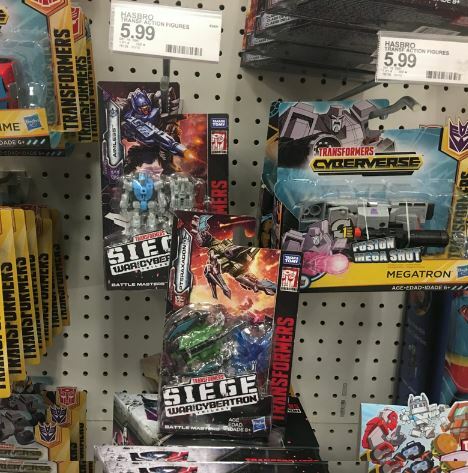 We see you too, assorted Cyberverse and other Siege figures. Are you able to share which fan site? Or is that not kosher on this forum? Where does DLX Greenlight fit into the picture? Greenlight is an exclusive. Exclusives by their very nature aren't part of general retail waves. 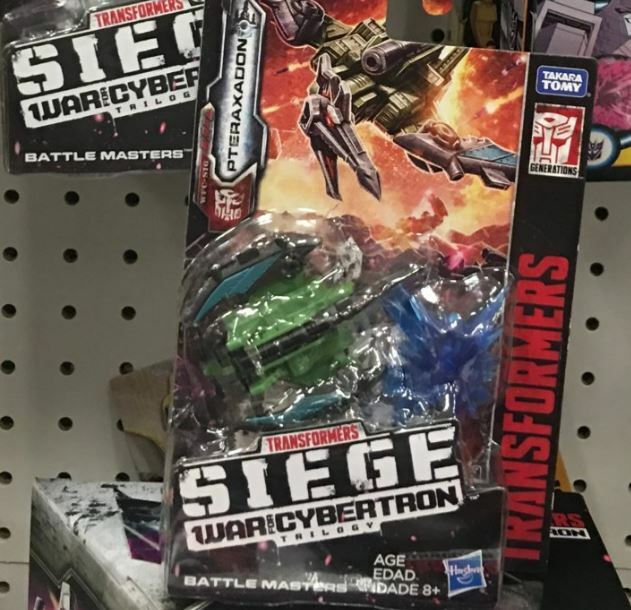 Saw these today, got a Teraxedon, it has a more involved transformation than I thought it would. Pleasantly surprised by that. A fair amount of it was confirmed by last Toyfair. Battlemasters include Smashdown and Caliburst, Micromasters are Off Road patrol and Decepticon cars, Deluxes include Refraktor and Brunt (or whoever Trypticon's partner is), Voyagers are Springer & Thundercracker. I don't think Commander or Titan class currently have "waves" since they are currently one figure at a time. Most of this stuff has been available to pre-order from Hasbropulse or Amazon since Toyfair, so it is confirmed. Leader w3 is December though, not Mid year with Deluxe w3. Definitely looking forward to Pteraxadon. POTP Slash will have her own battle axe. 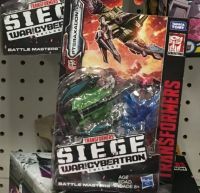 Yeah, while Hasbro tried to unify the release dates of all assortments with the same wave numbers, they are still seperate, so they’ll see their releases seperatly. 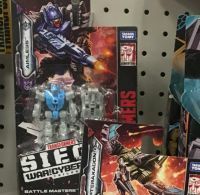 Hasbro seems to be trying to spread the leader class releases out more since they don’t sell as well. Astrotrain is in wave 3, BTW. Picked up a set in Virginia this afternoon. Found in Virginia too. Im very happy with Pteraxadon. He matches quite well with Thrilling 30 Springer. Gun mode on him is also nice as a secondary weapon. Aimless is good but hes what you would expect out of a traditional Targetmaster. A little boring. Nice effect pieces though. Oh, I almost got a news credit I posted this morning that I found them in Baltimore MD. Usually when I order something online, it pops up locally within a week of when I receive it from ordering online (if it isn't online only). As for the leader Prime, I knew he was due about the same time most other waves would be at wave 3, but I guess it makes sense he is technically wave 2 for his size. The wave 2 Micromasters are available online for decent prices, if your willing. I got both of them a few weeks ago for $25 together. As for Galaxy Prime. He is part of the wave 2 leader assortment, but that isn’t stated for released until July. 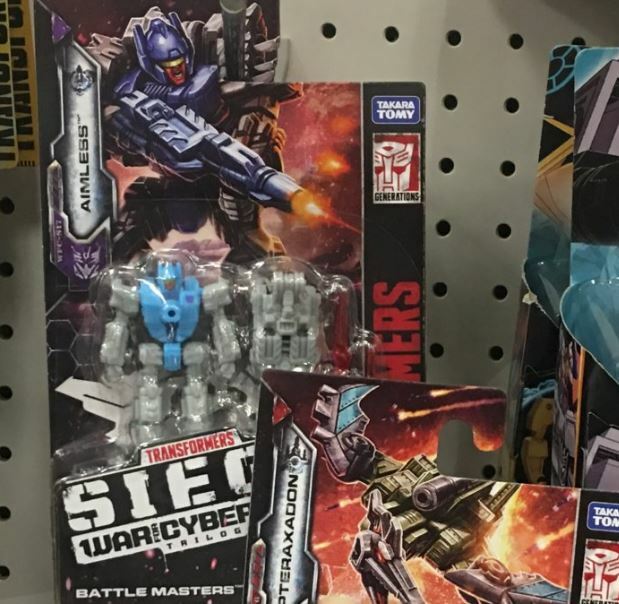 Now if the wave 2 Micro Masters would just appear already…. Is the leader Galaxy Force Prime considered wave 2 or 3? I haven't bothered to keep up with when that is supposed to hit. Figures, just got my overpriced Pteraxadon in the mail from Toywiz. Well look at the bright side you got them before any of us has seen them. @Daimao – Toywiz always overprices there toys Wal-Mart sells over size Rampage George for $19.99 where Toywhiz sells there\'s for $34.99 not included shipping. I\'ll just buy it in store or on Hasbro Pulse I\'m not dealing with third party stores unless it\'s third party Transformers. I know I paid too much but I had some OT money and I was impatient. It is a pretty sweet figure though, just need to find the right bot to wield his axe mode.